Miners had been drilling day and night to create the shaft 60 metres deep, which they finished on Monday and started lining with thick metal pipes. Their hope was to be able to cut across by Tuesday to find the toddler. "Technical difficulties have cropped up with the casing of the well after the depth of 40 meters," said a spokeswoman for the regional government at the site, adding that the thick metal pipes will be removed and drilling resumed. Julen Rosello fell into the 110-metre-deep shaft as his family walked through a private estate in the town of Totalan, in Spain's southern Malaga province, on Jan. 13. There have been no signs of life since. Rescuers found the borehole — 100 metres deep and just 25 centimetres wide — was blocked with earth, raising fears that soil had collapsed onto the child. Work slowed on Sunday after the drill bit hit hard rock, and officials said there was a risk of more collapses as they carved out the horizontal passage. 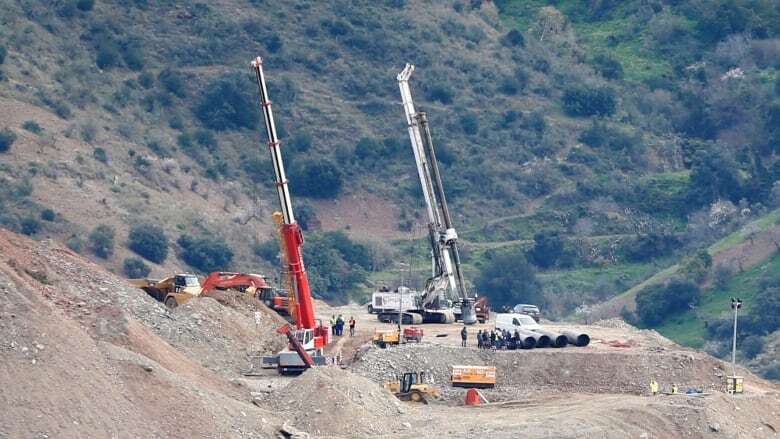 Angel Garcia Vidal, the lead engineer co-ordinating the search-and-rescue operation, said work also had to stop briefly early Monday to perform maintenance on a drill being used to create a vertical shaft. "We're at 53 metres, and we're just another seven metres away [from where] we start the next job of creating the chamber," said Garcia Vidal. Spain's El Pais newspaper reported his parents suffered another tragedy in 2017 when their three-year-old son died suddenly after suffering a cardiac arrest while walking along a beach.